Is My Friend an Alcoholic? Alcohol is a central nervous system depressant, 1 which means that it slows down brain activity. Despite being legal, some people become addicted to alcohol, which can lead to severe problems in the person’s life. 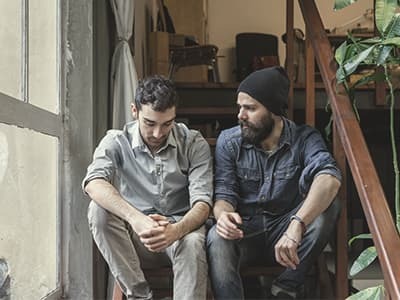 This article offers some tips for how to recognize an alcohol use disorder and how to help a friend who may have a problem. Alcoholics often display specific signs that indicate they may have a problem. When talking to a friend with a drinking problem, convey respect and express your concerns. Interventions can help a person abusing alcohol recognize the impact of his or her drinking. More than half of adolescents and adults over the age of 12 admit to drinking alcohol in the past month. 1 While some users of alcohol are able to drink in moderation, others develop a dependence on it. According to the National Institute on Drug Abuse (NIDA), a person who is addicted to alcohol experiences strong cravings for alcohol and will continue to drink despite personal harm. 1 Alcoholics often experience problems with their health, relationships and ability to carry out responsibilities at home, school and work. Being aware of the signs of alcohol addiction can help you recognize if your friend has a problem with alcohol. Unsuccessfully trying to cut down on drinking. Spending large amounts of time drinking or recovering from alcohol use. Strong urges or cravings to drink. Difficulty taking care of important responsibilities because of alcohol. Continuing to drink despite problems with family or friends. Giving up important activities or hobbies because of alcohol. Putting one’s self in dangerous situations while drinking. Continuing to drink despite psychological problems. Experiencing less of an effect with the same amount of alcohol or using more alcohol to get the desired effect (tolerance). Experiencing withdrawal symptoms when alcohol use is stopped. The symptoms of alcohol withdrawal can differ from person to person, with some people experiencing serious and potentially dangerous symptoms when they stop drinking. Generally, the severity of the symptoms depends on how long the person has been drinking and how much they have been drinking. In some cases, alcohol withdrawal can be dangerous and life-threatening. 3 If you suspect a friend is suffering from withdrawal, seek medical assistance immediately. Long-term abuse of alcohol can lead to liver problems, heart problems and cancer. Long-term abuse of alcohol can lead to serious consequences for drinkers and their family and friends. Treating alcohol addiction can prevent health problems, legal problems, accidents, job loss and broken relationships. Liver disease – Alcohol can have serious effects on the liver, which is responsible for breaking down the toxins in alcohol. Over time, the byproducts of alcohol can harm the liver, leading to chronic inflammation and the accumulation of fatty deposits. Heart problems – Heavy alcohol use can result in cardiomyopathy, which develops after the heart muscle is damaged over time, and arrhythmias, which occur when the heart pumps irregularly. Alcohol use can also put drinkers at higher risk of stroke, high blood pressure and heart failure. Pancreatic problems – Long-term alcohol use can harm the pancreas and may lead to pancreatitis. Cancer – Heavy alcohol use has been identified as a risk factor for developing cancers of the mouth, esophagus, pharynx, larynx, colon and liver. Weakened immune system – Alcohol suppresses the immune system and prevents white blood cells from protecting against bacteria. This can lead to a higher likelihood of contracting illnesses. Mental health – Alcohol impacts the neurotransmitters in the brain, causing them to relay information more slowly. This can result in depression, irritability and anxiety. Memory – Alcohol affects the neurotransmitter glutamate in the brain, which helps to regulates memory. When a person consumes large quantities of alcohol, he or she may “black out” and not remember the event. Long-term alcohol use can also cause serious memory issues. Fetal alcohol syndrome – Pregnant women who drink alcohol put their babies at risk of developing fetal alcohol syndrome. These children may have learning difficulties, behavior problems and delayed growth. 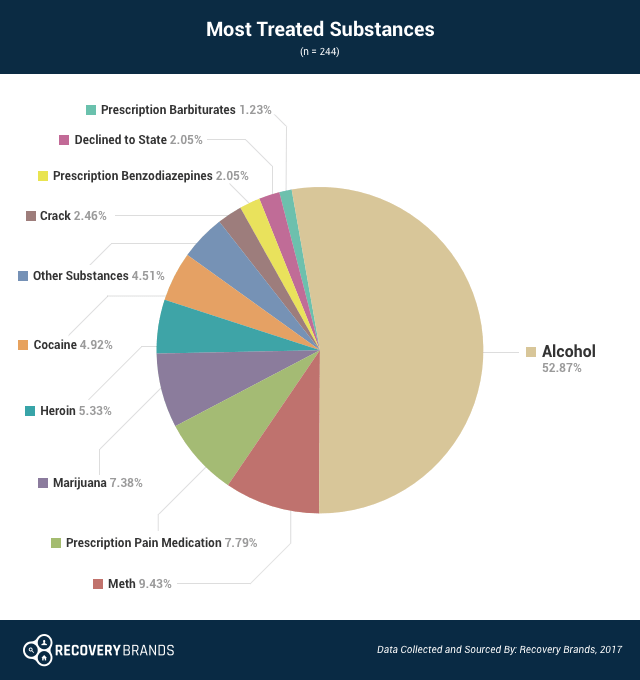 Alcohol, or ethanol, is the number one drug of abuse among recovering individuals, as reported by a 2017 survey from Recovery Brands. Almost 69% of people in recovery went to treatment for alcohol abuse, and a surprising 52.87% of those that responded reported seeking treatment for a problem with alcohol more than any other substance. Who Answers? to enroll in the best program today. Talking to a friend with a drinking problem can be difficult. Your efforts may be ignored or criticized. Taking time to consider how to talk to them can be beneficial. Timing is important. While it is best to talk to a friend while he or she is sober, this may not be feasible. Try to find a time when the person is calm. Some people are also more receptive to talking about their drinking problems shortly after they are faced with consequences, such as being arrested. Find a private place where your friend feels comfortable. If possible, talk to a friend in his or her home. Consider whether or not your friend would like other people present. Express concern. Feeling concerned about your friend is likely the reason that you want to talk to him or her. However, many people forget to express their concern because they become focused on their anger toward their loved one. Remind your friend that you are worried about his or her wellbeing, rather than shaming him or her. Provide treatment options and other support. Create a list of options to give to your friend, such as treatment centers, therapists and local recovery meetings. Providing several options may make your friend feel like he or she has a choice, rather than is being forced into getting help. Aggression. While it is normal to feel angry, expressing your feelings aggressively will likely make your friend defensive. Lecturing. Telling a friend what he or she needs to do can lead to anger and resentment. He or she may feel that you are taking away his or her freedom, rather than trying to help. Negativity. Focusing on all of the poor choices and mistakes your friend has made because of alcohol can cause him or her to feel guilty, which might lead to using more alcohol to cope. Making excuses. While you want to be supportive and gentle, making excuses for a friend’s addiction prevents him or her from experiencing the negative consequences of drinking. Who Answers? to speak to an addiction treatment advisor about which type of program is right for your friend or loved one. Being aware of the different treatment options available can help you when talking to a friend about alcohol addiction. Your friend will be able to consider the various options and choose which one works best for him or her. Detox programs offer 24/7 medical care for people withdrawing from alcohol. Doctors and other healthcare providers provide close monitoring and may administer medications to ensure a safe and comfortable detox. Many people transition to a treatment program after completing detox. Inpatient treatment provides housing as well as group, individual and family therapy for people struggling with addiction. Inpatient treatment is ideal for people who need a temporary break from triggers that may be present at home. Inpatient programs often include detox and medical care. Outpatient treatment provides group and individual therapy for several hours a week. People are then able to return home and have greater freedom to attend work and school. Many people choose to attend outpatient treatment after completing an inpatient program. Recovery meetings such as Alcoholics Anonymous (AA) and SMART Recovery can help people with drinking problems. Recovery meetings are free support groups that offer an opportunity to share personal stories, create a sober support network and learn new ways of coping without drugs and alcohol. AA takes an abstinence-based approach and uses a step-by-step program for sobriety, while SMART Recovery focuses on self-empowerment and evidence-based treatment. Seizures, or uncontrollable muscle spasms and contractions that in some cases can be fatal. Delirium tremens, a rare but dangerous form of alcohol withdrawal that involves confusion, hallucinations, shaking, sweats, fever and possibly death. If you notice any dangerous withdrawal symptoms in a friend detoxing from alcohol, call 911 or seek medical attention immediately. At times, family and friends need to intervene when they see a loved one struggling with addiction. An intervention is an opportunity to raise concerns, discuss the issues and identify a plan of action for helping the addicted person. Your friend is experiencing serious problems because of alcohol, such as health issues or legal problems. Your friend has expressed a desire to quit drinking in the past, but has been unsuccessful. You are concerned about the effects of alcohol on your friend. An intervention works by helping your friend become aware of the effects of alcohol on his or her relationships, health, work, school and other areas of life. As the person understands the connection between drinking and the problems in his or her life, he or she may be more willing to make changes. An intervention also provides a structured plan for getting help if the person is willing. This can include a list of treatment centers, therapists and/or local meetings. Some people choose to seek professional help for an intervention. A professional interventionist can provide guidance to family and friends on how to present their concerns. It is important to ask about the interventionist’s qualifications. You can also ask about the interventionist’s education, experience and which professional licenses he or she holds. Family and friends may not agree on what is best for the addicted person. An intervention involves coming together as a united front. If people disagree on whether or not the addicted person needs professional help, the intervention can be unsuccessful. Some ultimatums can have negative and even dangerous outcomes. Many family and friends become frustrated with their loved one’s addiction and may feel pressured to give an ultimatum, feeling that it is their last resort. However, the consequences of ultimatums, such as kicking a person out of the house, should always be considered. Support groups, such as Al-Anon, provide support to family and friends of people suffering from an alcohol use disorder. Meetings are free and held worldwide. Al-Anon provides an opportunity to connect with other loved ones of alcoholics and engage in personal growth by working the 12 steps and recognizing your powerlessness over your loved one’s drinking. Therapy and counseling can be a beneficial way to address your own difficulties coping with a friend’s alcohol problem. Trained therapists can help you identify the source of your stress, provide support and teach healthy ways of coping. Self-care is especially important when helping a loved one with alcohol addiction. While you may find yourself focused on your friend, it is important to care for your own needs in order to prevent stress, resentment and burnout. Self-care strategies can include exercise, journaling, reading, doing artwork, meditating or taking a bubble bath. If you are concerned about a friend’s drinking and he or she is willing to get help, call 1-888-319-2606 Who Answers? . Our representatives are available to assist you with finding a recovery program. The person who answers your call can confirm your insurance coverage over the phone and provide you with treatment options based on your coverage. The Substance Abuse and Mental Health Services Administration’s (SAMHSA) toll-free helpline offers referrals to local treatment programs that help people who don’t have insurance. Call 1-800-662-HELP (4357) to access this service.
. National Institute on Drug Abuse. (2014). Alcohol.
. McKeon, A., Frye, M. A., & Delanty, N. (2008). The alcohol withdrawal syndrome. Journal of Neurology, Neurosurgery & Psychiatry 79(8), 854-862.
. National Institute on Alcohol Abuse and Alcoholism. (2015).Beyond hangovers: Understanding alcohol’s impact on your health NIH Publication No. 15-7604.